We are back at it again with another review on an awesome BOSS product. For those of you who don’t know, BOSS is known for developing some of the best-quality pedals around right now. The downside to this is that most BOSS pedals can get rather expensive, which can turn off some users who are not looking to spend a whole lot on guitar accessories. Thankfully, the BOSS FV50-H is a rather affordable option for those of you who are looking to buy a high-quality volume pedal at a reasonable price. In this review we will be checking out everything you need to know about the FV50-H, so you will have a good idea about whether this volume pedal is right for you or not. So without further ado, let’s go ahead and check this pedal out! Let me start off by mentioning that are two different BOSS FV-50 models. The one that we are reviewing today is the FV-50H, so don’t let that be confused with the FV-50L that BOSS has also released. The difference between these two pedals comes down to where they should be placed in your signal chain. The FV-50H should be placed at the start of your signal chain, while the FV-50L should be placed at the end. You should also note that the FV-50H is a high-impedance volume pedal, while the FV-50L is a low-impedance volume pedal. In addition to this, the FV-50L can be used with both guitars and keyboards. These are the key differences between the BOSS FV-50H and the FV-50L. The BOSS FV50-H is a durable volume pedal that comes in at 86 (W) x 200 (D) x 54 (H) mm (3-3/8" x 7-7/8" x 2-1/8") in size, and weighs only 400 g (14 oz). As you would expect, the FV50-H is very simple and easy-to-use. 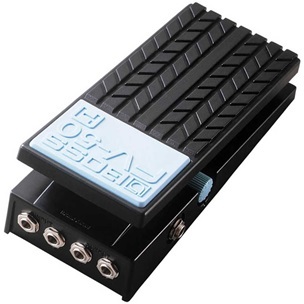 The pedal features 5 x 1.4” jacks that are located on the side of the unit. 2 of these are input jacks, 2 are output jacks, and the last one is a tuner out jack. One thing that I should mention is that this pedal is a stereo device. This is made apparent by the two input and output jacks that are located on the side of the pedal. To be honest, I don’t think this feature is really that necessary, but it means you will be able to plug two instruments into the pedal and alter their volume at the same time. This can be pretty handy if you are planning on using the pedal on stage with another performer. The FV-50H also features a tuner out jack that allows you to (obviously) plug your tuner into the pedal. This is a nice little addition to have to keep your set up nice and neat. The pedal is constructed out of both metal and plastic. As you can likely see, the top of the pedal is made out of plastic while the base of the pedal is made out of metal. 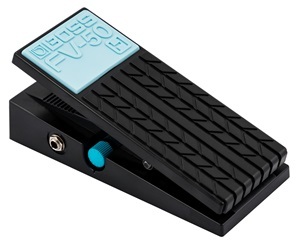 As for the looks of the pedal, I would say that the FV-50H looks pretty nice overall. I am personally a big fan of the classy black finish. In saying that though, I think the blue patch found on top looks a bit out of place. This is obviously just me being a bit nitpicky, but that’s what you have to do when you are reviewing a new product. I try my absolute best to be as thorough as possible! One of the best things about the BOSS FV-50 is that it features a ‘Minimum Volume’ control knob. This is a staple feature that is seen in many of the other volume pedals that have been produced by BOSS. As the name suggests, this knob sets the minimum volume of the pedal. This will change depending on the type of performance you are planning to perform. 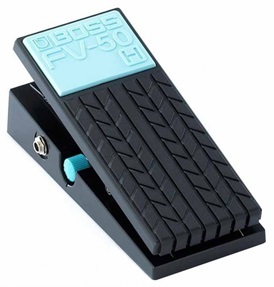 Let me start off by saying that I think the BOSS FV-50H is a very nice volume pedal. I am not going to lie, the light weight of the FV-50H made me a little bit worried that the pedal wouldn’t hold up very well, but I have read some customer reviews online who have said that their pedal is still going strong after many years of owning it. Overall, the BOSS FV-50H is very light, durable, and easy-to-use. In addition to this, it is also reasonably priced for a pedal of this quality. If you are a guitarist who is looking for a pretty straightforward volume pedal then the FV-50H could be exactly what you have been looking for. I have no problem recommending this pedal to any of our readers, regardless of whether you are a beginner or more experienced musician. Anyone will be able to benefit from a volume pedal like this one. For more information on the BOSS FV-50H, you can check out the instruction manual here.